Take a leisurely stroll through the pretty cobbled streets of the old town lined with chic designer shops before enjoying a refreshing cool beer in one of the many café dotted around Place aux Herbes; wander around the daily market and be assailed by the exotic smells and colourful displays of plump red peppers and tomatoes, glistening purple aubergines and waxy oranges and lemons; enjoy a relaxing day of sunbathing on the terrace of your private luxury villa with splendid views of the glistening blue Mediterranean and then dine on freshly caught fish at one of the many charming restaurants lining the seafront. Part of the Alpes-Maritimes and strategically located just inside the French-Italian border on the French Riviera, close to Monaco and yet only 30 minutes from Nice by train, Menton is a beautiful seaside town surrounded by lemon and orange groves and home to some of the most wonderful gardens in France. A popular destination for both holidaymakers and property owners, Menton is often called ‘La perle de la France’ (“The pearl of France”) and is regarded as the most beautiful town on the French Riviera. Those looking for Menton property for sale will not be disappointed as there is a wide range to suit all tastes and budgets and it is becoming increasingly sought after by investors wishing to own their own little piece of paradise on the Côte d’Azur. With its close proximity to both Italy and Monaco, Menton’s history reflects its strategic importance; incorporated into the Republic of Genoa in the 13th century by the Vento Family it was subsequently acquired by Monaco – then part of the Republic of Genoa - and ruled by the Princes of Monaco until the French Revolution when it was annexed to France. In 1814 Menton was included in a reconstituted principality of Monaco which, after Napoleon's Hundred Days in 1815, became a protectorate of the King of Sardinia. Menton seceded from Monaco in 1848 proclaiming itself a free city but two years later again became a protectorate of the King of Sardinia until 1860 when the whole region of Nice was annexed to France as a reward for French help in Italy’s war against Austria. In the 19th and early 20th Century Menton was a mecca for the British aristocracy and bourgeoisie who flocked to the town to enjoy its particularly mild climate and escape the British winters; their legacy includes the Menton’s famous gardens scattered across the outskirts of the town. Menton’s Italian heritage is most evident in the old town; perched on top of the hill it features a maze of narrow medieval lanes lined with traditional Provençal houses. It is easy to spend a leisurely hour wandering through the streets, stopping off every now and again for an espresso or glass of wine before arriving at the top where you can visit the Botanical Gardens of Val Rameh. These gardens were created in the early 20th century by a former British governor of Malta and are mainly famous for their large variety of exotic species that could not survive anywhere else along the northern coast of the Mediterranean but in the micro-climate of Menton. If you are in town during February then you can enjoy watching the Fete du Citrons which is held for two weeks in February every year and features sculptures and decorative floats made from lemons with the floats processing their way along the Menton seafront. After all this walking, head back down to the seafront and harbour, where there are a number of excellent restaurants and bistros to enjoy a relaxing drink and feast on fresh seafood cooked in local olive oil and garlic followed by Menton’s famous lemon tart. There is a wide range of Menton property for sale from Provençal town houses to luxury apartments in private residences and secluded villas set in landscaped gardens. Menton property for sale in the centre of town has the twin advantages of being close to the shops and restaurants and yet walking distance from the sea, beaches and harbour. Menton’s charming and picturesque town houses are perfect for large families and typically can be found for around €500,000. With a minimum of two storeys and topped with terracotta tiled roofs, most have either whitewashed walls or are painted in the warm colours typical of Provence and they often come with charming walled gardens full of local tropical shrubs and brilliant flowers. Some can also be split into good sized apartments thus making excellent rental properties. Apartments in Menton come in all shapes and sizes – choose from spacious airy properties right in the town centre, a cosy studio close to all amenities or a charming renovated apartment with stunning views across the Mediterranean Sea. Prices vary according to size and location; for example, a one bedroom top floor apartment with large terrace and panoramic views of the sea and the old town will cost in the region of €400,000 rising to €480,000 for two bedrooms. If you are looking for a luxury and secluded villa then you are also spoilt for choice. Often on larger plots of land, these properties typically have private swimming pools, large stone terraces with panoramic views of the sea and the town and landscaped gardens brimming with lush shrubs and beautiful flowers. Villas from the 18th century will also have wonderfully grand entrance gates with sculpted pillars and sweeping drives up to a colonnaded entrance. Prices for villas typically start at around €600,000 rising to between €2m and €4.5m for the larger and more secluded modern and ‘Belle Epoque’ villas perched on the mountain side or by the sea. Whether you decide to buy a Provençal style townhouse with walled garden, a modern apartment with sun soaked terrace and panoramic views or a luxury and secluded 18th century villa gazing out across the sparkling Mediterranean Sea, the wide range and standard of Menton property for sale provides investors with the perfect opportunity to buy property in one of the most beautiful towns on the French Riviera. 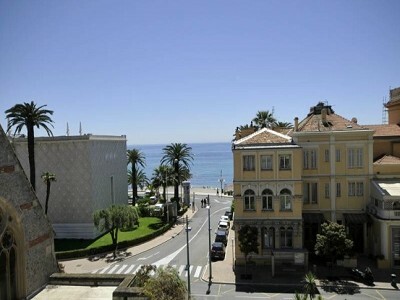 Although more expensive compared with the rest of France, prices in Menton have fallen so now is a good time to buy. The combination of the sea, the marinas, the historic old town set against the mountains and the magnificent gardens make Menton one of the most popular and vibrant destinations on the Côte d’Azur.